High school English teacher. Disciple of Clarissa Darling. A Kristy Thomas with Dawn Schafer rising. Blue ribbon water-treader. Leo. Ravenclaw. Dalek. A slave named Cora escapes from her sadistic master and relies on the help of the underground railroad (an actual train in this novel) to get to freedom. A luxury hotel that purports itself to be the safest in the world due to extensive and invisible security measures allows two killers into its midst; hotel staff members die bloody deaths, one by one. I guess the first thing I should say is that this is one of two Oprah’s Book Club picks for this year. Even before the Oprah mania started, though, this book was getting tons of buzz. I listen to a lot of podcasts about books and publishing, and this was one of the books every single podcast I listen to was talking about. After reading it I totally understand the hype! The story is an Odyssey-like tale centered around Cora’s escape from a cotton plantation in Georgia. On the plantation, where the story begins, Cora is an outcast within the slave community living there. This is due to both the stigma of her mother–the only successful runaway from the plantation in years (maybe ever? )–and an incident with a few of the slave men. Everyone thinks Cora is crazy except Caesar, who treats her as a good luck charm and asks her to flee the plantation with him. After a particularly horrific incident that takes place during a celebration in the slave quarters Cora consents, and the two leave at dark to meet a man in town who’s part of the underground railroad. The underground railroad in Whitehead’s novel is an actual train and each time Cora marvels at it someone reminds her that, like many other structures in America, slaves built it. I loved Whitehead’s interpretation of the underground railroad because while we often focus on white abolitionists who helped slaves escape, this little bit of magical realism helps us focus on the strength of the black community just as much (if not more). The rest of the story unfolds at stops along the way to freedom. Cora is pursued by a talented slave catcher named Ridgeway, so she is never able to settle anywhere for very long. At each stop, though, Cora learns more about the world: she learns to read, begins to understand that slavery is not the only way white people are trying to keep black Americans under control (think sterilization), loses friends, and has more than one run-in with Ridgeway (a character both interesting and despicable). I absolutely loved this book. One other popular novel about the atrocities of slavery that I love (and reread every year with my students) is Toni Morrison’s Beloved. Each time I read that one I cry, and I found myself crying during Whitehead’s novel too. I don’t think this should make anyone shy away from the it though, because it’s such an immersive, hopeful book too. Security is one of the coolest books I’ve read in years. Reading it felt like watching a movie, though it’s not written in script form. Each chapter begins by telling us which cameras we’ll view the characters through and it soon becomes clear that the hotel is filled with security cameras, both visible and invisible, and that we’re reading the story play out through the cameras’ perspectives. The narrator is pretty mysterious as well. We know he can see everything through the security cameras. He sees the main character Tessa–the hotel manager–going through checks of the hotel. He sees the chef freaking out about the menu and a maid trying to get a small, mysterious bloodstain out of the white carpet. He also sees a killer murdering staff members one by one, cleaning the blood off of his coveralls, and shoving food under the mask he’s wearing.It’s not clear yet what the killers’ purpose is or why our narrator won’t warn anyone about what’s happening, but the reveal toward the end of the story is pretty cool. In addition to the murderous plot at the forefront of the novel, the characters in it are great. Tessa is an emotionally unavailable, meticulous hotel manager who spends her days making sure everything will be perfect for the grand opening, but when her estranged foster brother shows up at the hotel after years of silence she has to deal with the emotional implications of this reunion (as well as the murderers stalking her employees). As the bodies stack up, the emotional stakes for Tessa and Brian escalate and I found myself almost shouting for these characters to RUN! and HIDE! and STOP OPENING THAT DOOR! Lastly, Wohlsdorf uses a sort of split screen effect in places so that we’re reading what several characters (including the killer) are doing at the same time. The suspense this creates is insane, and I would love to read more horror novels that use this style choice! I’ll include an example below. I highly recommend this book for fans of scary movies and cool writing style choices! 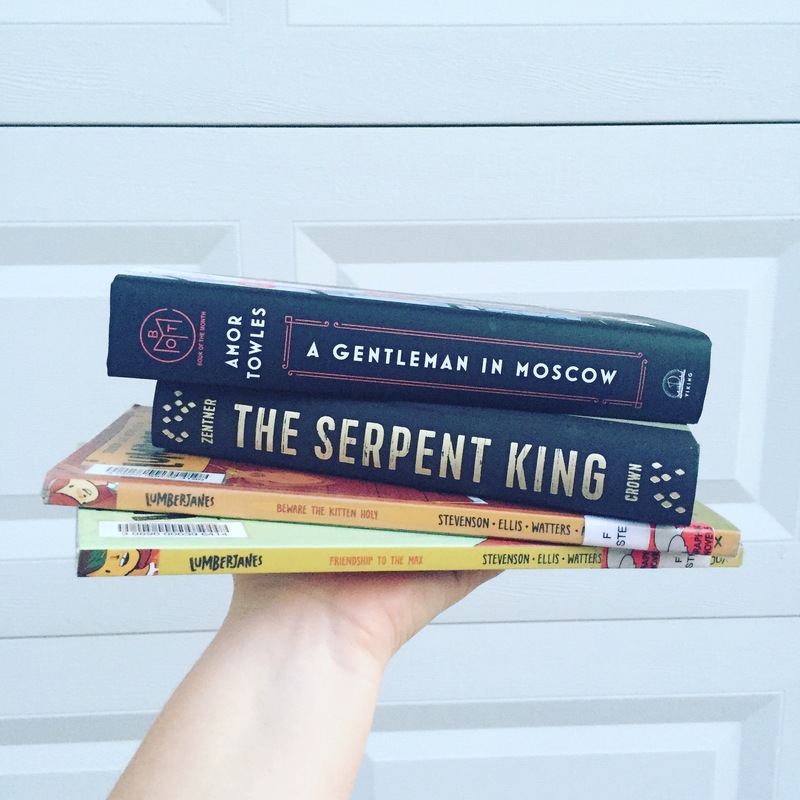 A Gentleman in Moscow by Amor Towles: This is my September Book of the Month Club pick. I’m already a few pages in and I love it so far! It takes place after the Russian Revolution and tells the story of Count Alexander Ilyich Rostov, a man who’s been placed under house arrest in a hotel due to his aristocratic status. It’s funny and beautiful so far and I can’t wait to see how Rostov, a man used to seeing the most beautiful places in the world, adjusts to life in a small space. Lumberjanes (Vol. 1 & 2) by Stevenson, Ellis, Watters, Allen, and Laho: I’m on a mission to keep my graphic novel/comics game strong and I’ve heard so many good things about this comic! Girls + woods + merit badges + supernatural enemies = a good time. The Fifth Season by N.K. Jemisin: This book won the Hugo this year (a prize for science fiction) and N.K. Jemison is the first black woman to do so. Super exciting! I immediately reserved it in my local library system’s database and just got the message that it’s in transit. That always makes me so happy! The Serpent King by Jeff Zentner: My friend and school librarian Laura (whose blog you can read here) let me borrow this YA novel. I’m most excited about reading it so I can talk with her about it! She says Zentner’s depiction of the South is really cool, and I’m always looking for great southern YA to add to my arsenal. Have a good week and happy reading, everyone! I read twenty-three books this summer, guys. I have no idea if that’s a personal best or not because this is the first summer I’ve actually tracked my reading. Some good, readerly friends (I’m looking at you, Kelsey and Laura) suggested that I get into Goodreads, and though people have mentioned it before I somehow never had the desire to track my reading. Now I’m pretty obsessed with it and my favorite part is that you can scan the barcode of your book and BOOM!, it’s ready to be shelved on one of your booklists. Though Goodreads isn’t a totally comprehensive tracking site (you can read about what it’s lacking in this great Book Riot article by Amanda Nelson), it works well if your main goal is to remember what you read. All My Loving: These are my most highly rated books of the summer. I loved them and want everyone else to read them. If you tell me you’ve also read any of these books, I’ll promptly request a coffee date so we can talk about them. I Want to Hold Your Hand: These are books I simply liked, but for some reason couldn’t include in the “loved” category. This is due to either personal preference, my current reading mood, or something about the book itself. Hello, Goodbye: I want to stress that my reason for putting some books in the lowest category is simply personal preference. All of these are fine books written by people who are way more talented than me. However, for one reason or another I didn’t vibe with them. I’ll try to lay out why in my brief discussion of each. Imagine waking up in a world that’s almost like yours. People know you, but your job is different. You no longer have a wife. There’s different art hanging in your apartment. Dark Matter explores regret, physics, family, and love. I’m always a sucker for alternate timelines, time travel, and the road not taken, so Dark Matter was a perfect end-of-summer read. The first novel in this series is in my “like” list. When I read The Queen of the Tearling I knew I was going to like the series. Somehow, though, Johansen adds a new layer of meaning and plot to the second installment, and that element put this one in the “love” category. There are really cool flashbacks to a scary world, not unlike our own. I suggest you read it to see what I’m talking about. I think this is a MUST-READ series! As a huge fan of the television show and movie based on Thomas’s snarky girl detective, I was really psyched when I found out he’d written two sequel novels. They pick up where the movie left off. Reading these was like sitting in the comfiest chair with the warmest cup of tea. The familiarity of Veronica and her gang of crime-busters was just so nice. I think people who haven’t watched the series or the movie would like these too. This was probably my favorite book of the summer. Every podcast I listen to recommended it and compared it to The Martian by Andy Weir. Though the stories differ completely, the way the stories are told–in a series of interviews and documents–is similar. The rich characters, smart writing, mysterious narrator, and alien technology rung all my bells. This was a fun read and I’m so happy there will be more novels in this series! I fell in love with Emma Straub this summer. I stalk her instagram, envy her apartment, think her children are cute, and want to read everything by her. Her novels also have the brightest, happiest covers. I began the summer with Modern Lovers, which is about the former members of a college band who’ve grown up and moved to a close-knit neighborhood in NYC. Since one of the band members got really famous and died young, studio executives are hounding the band’s other members to release their life rights for a movie based on their college years. We follow these adults as they grapple with their past, fight with and love each other, and try to stay together despite life tearing them apart. We also follow their very cool kids, who don’t know what to make of their parents or themselves. It’s such a nice slice-of-life novel. The Vacationers is also about a close group of people, a family going on vacation together. It’s got great characters, a coming-of-age romance for the recently disgraced teenager, and tons of fun character interactions. It’s a beach read, I guess, but it could definitely be read in the fall as we’re all preparing to deal with our own families during the holidays! This was my first Jacqueline Woodson novel, though I plan to read Brown Girl Dreaming sometime in the near future. Another Brooklyn is full of memory and rememory. The main character, August, looks back on her childhood in 1970s Brooklyn where she and her three friends felt more beautiful and popular than everyone else. They helped and hurt one another, listened to each other’s stories of abuse and neglect and love, and–as happens with most childhood friendships–parted ways. August remembers the girls as they were and tries to reconcile this with who they are now. It was a beautiful and short read and I would love to share this with my students at some point. An opera singer with a secret history finds out that someone has written an opera about her life. Whodunit? Her former lover? friend? mentor? other lover? I loved the rich storytelling by Chee here as well as the engrossing tale of Lilliet Berne’s ever-changing life. It reminded me of a Dickens novel in a way, which is a great thing in my book. This book popped up on a lot of “summer must-reads” lists and I’m really glad I read it. If you are interested in food and wine, the restaurant industry, New York City, the coming-of-age of a young girl, or just fun, slice-of-life storytelling, you’ll like this one too. Red Queen reminded me a lot of the Hunger Games or Divergent series. Its main character is a young girl who finds out she’s special somehow. When she publicly displays a strange and terrible power, she is made to masquerade as an upper-class silver and be betrothed to one of the princes. I really liked this YA novel and plan to read the others in the series at some point. Toni Morrison can do no wrong in my book. This is her first novel and it is about a young black girl who believes she’s ugly. After abuse and ridicule, she wishes God would give her blue eyes. Morrison’s meditation on beauty, rejection, and abuse is fascinating, heartbreaking, and beautifully written. I could read her prose all day long. The reason this isn’t in the highest-ranking category is simply because it made me want to cry bitter tears several times. This isn’t necessarily a bad thing, but I have to say I would only recommend this to people who are emotionally ready for it. Based on the story of the Manson family, Cline’s novel meditates on all types of girls: cool, dangerous, neglected, needy, beautiful, taken-advantage-of, etc. She also shows how easy it is to become enamored by yourself or another person. The main character spends time not only recapping her own involvement with the murderous cult, but also meditating on the reason she didn’t participate in the horrendous acts in which they engaged. She asks herself if she was lucky or different than the rest of the girls in the cult. She asks herself how she can be better now, later in life. I really loved The Girls and would recommend it to people who love true crime (even though this is fictional). This was a great little mystery. I received it as part of my Book of the Month subscription and chose it because the lead character was described as a “smart, lonely, bitingly funny detective with Scotland Yard.” How could I resist? This mystery, about a young girl who goes missing after a wild night, had me guessing until the resolution. I’m definitely a Potter Head, so when I heard there was a play coming out set ten years after the Battle of Hogwarts I knew I would need it the moment it was released. My brother and sister-in-law purchased a voucher so I could go to the midnight release party at Books-a-Million, and the whole experience of getting the book at midnight with tons of other fans transported me back to my college and graduate school days when the last few books came out. I had a few problems with the play: it was…a play, and therefore too short for my taste. A couple of the characters made decisions that felt off-canon. Some major characters I loved didn’t show up at all. However, I generally liked it because I got to visit my favorite characters again and see how their children turned out. Sure, I would have liked to see Luna Lovegood and Teddy Lupin, but what Rowling, Tiffany, and Thorne came up with was, overall, satisfying. As stated above, I loved the second novel in this series. Nothing to sneeze at, the first installment is thrilling as well. These books take place in a kingdom of people who were disenchanted with what America had become during the twenty-first century. They, led by a man named William Tearling, sailed to unpeopled land and left technology behind. The Tearling, one of the four or five provinces that make up the larger kingdom, has been without a queen for years. The story begins with a girl named Kelsea who has lived deep in the woods with her godparents for eighteen years, preparing for the day she would be taken to the Tearling to claim the throne. Along the way she has to dodge multiple assassination attempts, confront her mother’s problematic legacy, and battle it out with the dangerous Red Queen. Sherlock Holmes and John Watson’s descendants meet at boarding school in this YA detective story. Charlotte Holmes has been raised from birth to deduce and solve crimes. After Jamie Watson shows up at her boarding school, someone starts committing crimes in the fashion of the Sherlock Holmes stories and the whole campus suspects that these teens are behind them. Smart, funny, and addictive, this story left me wanting more of Charlotte and Jamie! If you like teen detectives, the Sherlock Holmes stories, or young adult lit in general, this one is for you. I’m starting to realize I read a lot of mysteries this summer. The Woman in Cabin 10 was another Book of the Month Club pick, and I chose it because I love mysteries that take place in close quarters. This one is set on a small luxury cruise ship. A woman goes missing and our protagonist is the only traveler on board who saw her before she died. This was an exhilarating read, for sure. I came for the comedy and stayed for the stories of survival. Amy Schumer talks about her difficult relationship with her mother, he father’s multiple sclerosis, and an abusive, almost fatal previous relationship. It was also hilarious, as is on-brand for Schumer, and I came away with a new respect for the comedian. Adam Hamilton’s views on the Bible were seen as very controversial when this book came out. I, for one, found a lot of hope and comfort in this book. I’ve recommended it to several friends and plan to read more of Hamilton’s work! I really wanted to find a series to read this summer. This one was not for me. I’m sure it gets better as it goes, but I couldn’t get over how much I despised the main character, Stephanie Plum. She has no business being a bounty hunter (which I get is the point…but it just bothered me). The novel is supposed to be about her ineptitude, but I kept thinking she was going to get a bit smarter. I picked up the second novel to see if there was some progression and it looked like she was just as ditsy as before. Again, this is just me. I know people who love this series and I totally understand why. It just wasn’t my jam. After I abandoned the Evanovich series I decided to try this female-centered detective series. There were certainly things I liked about it: it’s set in a very cool futuristic Earth, the main character was smart, the mystery was…mysterious. There was just something about the love scenes (and this is a good place to note that J.D. Robb is a pen name for Nora Roberts) that struck me as strange. I’ve never read a Nora Roberts book, and though I’m certain she’s a great romance writer–her sales speak for themselves–the scenes in this book reminded me a lot of 50 Shades of Grey. This was, of course, written before the publication of that book, but since I read Shades a few years ago I don’t want to go near anything else that reminds me of it. I think the power dynamics between the two romantic leads here (rich, powerful man and mousy girl) reminded me too much of that book. Maybe the rest of the books are great, and I’m not saying I’ll never pick another one up…I just have to put it in the lowest category as it was one of my least favorites of the summer. Do you have any suggestions for me based on anything you’ve read here? Hi everyone (Mom, Dad, Husband, other family members, loyal friends, internet trolls, accidental link-clickers)! Thanks for clicking here. As many of you know, last year I started a blog about books. I called it Bumblereader (and you can still see it here for another month or so). The concept behind that blog was that I would read one book a week and write about it. Last year was a weird time of grief and happiness and firsts and goodbyes. I felt I needed something to anchor me, a THING to do that would help me avoid hard questions. When someone asked how I was feeling or what I was up to, I could just say, “oh, I’m reading a book a week” instead of the realest truth, which was that I was grieving over the death of my young sister, learning how to be a married lady, and all-around screwing up at being a normal, adjusted person. I made it through 35 weeks of reading a book a week–I’m proud of that fete. And though I stopped blogging after week 35, I’m happy to say that I will end this year having read, on average, more than one book a week. I’m very humble and quiet about accomplishments (nope). I had the best summer just reading, going on long walks, listening to new podcasts, seeing the beautiful new babies my friends have had, and hanging out with family. I read more than I thought I would, considering I didn’t have a weekly deadline anymore, and this helped me realize that what I loved about my 35 weeks of blogging was talking about books. What I hated about it was keeping to a super-strict schedule. Reading one book a week made me a bad reader: I avoided libraries (because they sometimes didn’t transfer the books I wanted on time), read really crappy stuff because I didn’t want to put books aside and have wasted time, and spent more money on books than I should have. So this blog is going to be a bit different. I won’t keep to a strict reading schedule, though I do want to post at least once a week. Some of my posts will be about books I’ve read, others will be about bookish stuff, and some will be about my TBR (to be read) pile or books I’m looking forward to reading. I’m mostly reading around a book a week anyway (just not by a certain day anymore), so I’ll have plenty of new stuff to post. The major thing that has made me want to blog about books again is the reaction I got from people who read my last blog. Several people messaged or stopped me to say they’d read a book because I recommended it. That kind of stuff warms my heart and I want to keep sharing what I read (even if my readership dwindles down to just family and close friends). My first post will be about the books I read this summer, so it’ll be a long post. I can’t wait to talk about some of the great stuff I got to read!